2019 February home sales were steady, but are behind last year’s levels, down – 2.5 % compared to February a year ago. Home sales this month were 1,464 compared to 1,501 in February 2018. 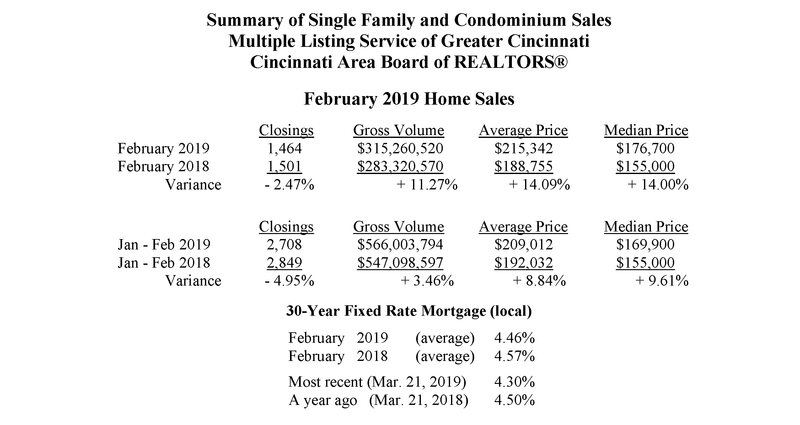 “Even though home sales this month were down compared to last year, February 2019 had the second most sales of any February in more than 10 years,” said Michelle Billings, President of the Cincinnati Area Board of REALTORS®. “Since there are plenty of buyers and with the interest rates remaining low, this makes it a great time to list or sell your property. A property in move-in ready condition and priced reasonably, in today’s market, should be a perfect scenario to sell quickly,” said Billings. The February average home price climbed to $215,342 compared to $188,755 a year earlier, a + 14.09 % increase. At the same time, the inventory of homes for sale, as of February 28, continued its year-over-year declining trend, dropping from 4,027 a year ago to 3,828 in February 2019, down – 4.94 %. “Cincinnati was recently ranked 6th out of the 50 biggest metros in the USA, by Bankrate.com, for being one of the top areas for first-time homebuyers. This ranking was based on affordability, culture, job market and safety. Cincinnati was the only Ohio Metro area that made the top 10 list,” said Billings. With low interest rates, unemployment at or near the national average, the influx of good-paying technical jobs and very affordability housing, Greater Cincinnati is a great place for first-time homebuyers and families to reside. Local home mortgage rates in February averaged 4.46% for a 30-year fixed rate loan. The rates were down compared to 4.57% a year ago. At these fixed rates, the monthly principal and interest payment on a $100,000 home loan with no money down would be approximately $504. “REALTOR’s are available to help guide consumers through all the important details involved in buying and selling a home. A REALTOR will assist them through the entire process and is your absolute best source for professional and accurate information,” said Billings. Nationwide, February home sales were up 11.8% compared to January on a seasonally adjusted basis and were down – 1.8% from February 2018.